Risotto rice is a great substitute for pasta in salads. Feta cheese is low in lactose and should be tolerated by most individuals with a sensitive gut. 1. Preheat the oven to 200°C/R6. Toss the courgettes in the olive oil and place on a baking tray at the top of the oven. Bake for 15-20 minutes until they are soft and beginning to brown. 2. Place the rice in a saucepan and add the stock. Bring to a simmer and cook for 12 minutes until soft. Allow to cool. Meanwhile, toast the pine nuts in a dry frying pan until golden. 3. 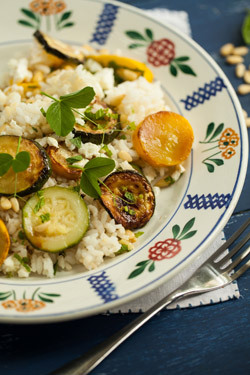 When the courgettes are cooked, remove from the oven and add to the pine nuts and rice. Squeeze over the lemon juice and season with salt and pepper. 4. Add the feta and mint and mix well. Serve immediately or keep in the fridge until required. Why not… pack up one quarter of this salad in a lunchbox and keep cool until lunchtime?